, a celebrated professor of divinity in Holland, of the Arminian persuasion, was of a good family, originally of Maestricht, and born at Amsterdam, June 19, 1633. 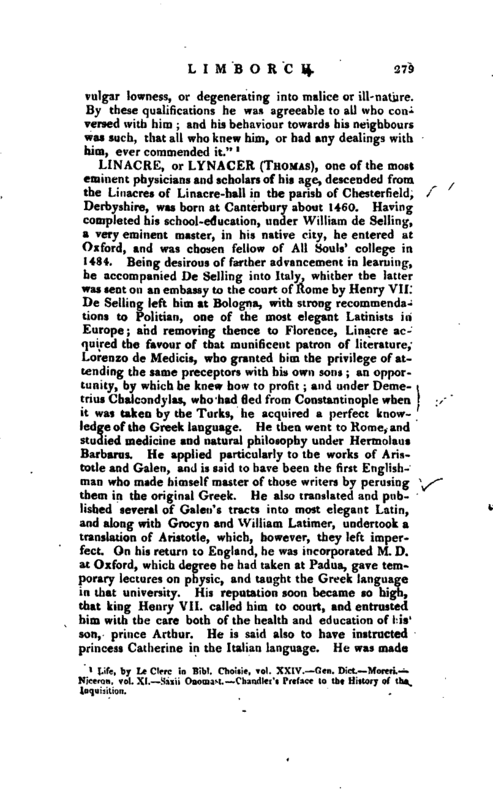 He passed the first years of his life in his father’s house, going thence daily to school; and then, attending the public lectures, became the disciple of Gaspar Barlaeus in ethics, of Gerard John Vossius in history, and of Arnold Sanguerd in philosophy. This foundation being laid, he applied himself to divinity under Stephen Curcellseus, who succeeded Simon Episcopius in that chair, among the remonstrants. From Amsterdam he went to Utrecht, and frequented the lectures of Gilbert Voetius, and other divines of the reformed religion. In May 1654, he returned to Amsterdam, and made his first probationsermon there in Oct. following. He passed an examination in divinity in August 1655; and was admitted to preach publicly, as a probationer, which he did first at Haerlem. The same year he was invited to be stated minister of Alcmaer, but declined it, not thinking himself yet qualified for that important task. In 1657 he published a course of sermons in Dutch, by Episcopius, his greut uncle by the mother’s side, and the same year was invited to be minister of the remonstrants at Gouda, where there was a numerous congregation of that sect. He accepted this vocation, and exercised the ministerial function in that town till he was called to Amsterdam. 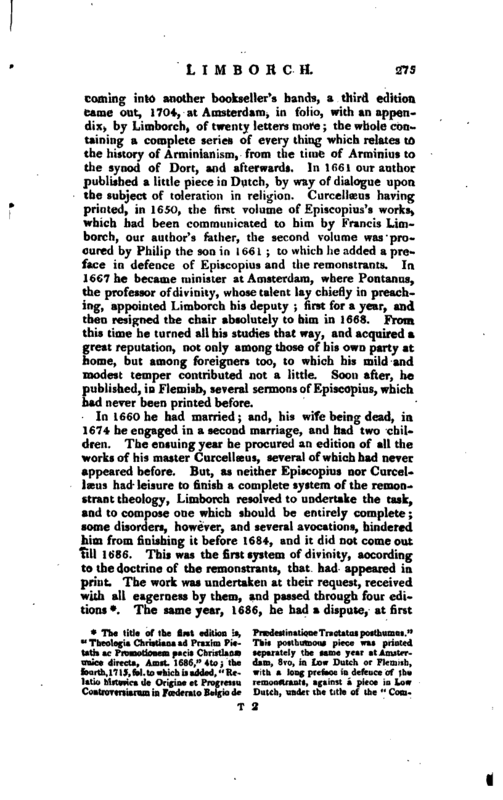 Having inherited the papers of Episcopius, he found Among them a great number of letters relating to the affairs of the remonstrants; and, communicating these to Hartsoeker, minister of the remonstrants at Rotterdam, they joined in disposing them into a proper order, and then published them under the title of “Epistolae praestantium et eruditorum Virorum, &c.” at Amsterdam, in 1660, 8vo. These being well received by the public, Limborch collected more letters, and published a second edition, corrected and enlarged, in 1684, fol. After which, the copy | feomlng into another bookseller’s hands, a third edition came out, 1704, at Amsterdam, in folio, with an appendix, by Limborch, of twenty letters more; the whole containing a complete series of every thing which relates to the history of Arminianism, from the time of Arminius to the synod of Dort, ad afterwards. In 1661 our author published a little piece in Dutch, by way of dialogue upon the subject of toleration in religion. Curcellseus having printed, in 1650, the first volume of Episcopius’s works, which had beea communicated to hi<n by Francis Limborch, our author’s father, the second volume was procured by Philip the son in 1661; to which he added a preface in defence of Episcopius and the remonstrants. In 1667 he became minister at Amsterdam, where Pontanus, the professor of divinity, whose talent lay chiefly in preaching, appointed Limborch his deputy; first for a year, and then resigned the chair absolutely to him in 1668. 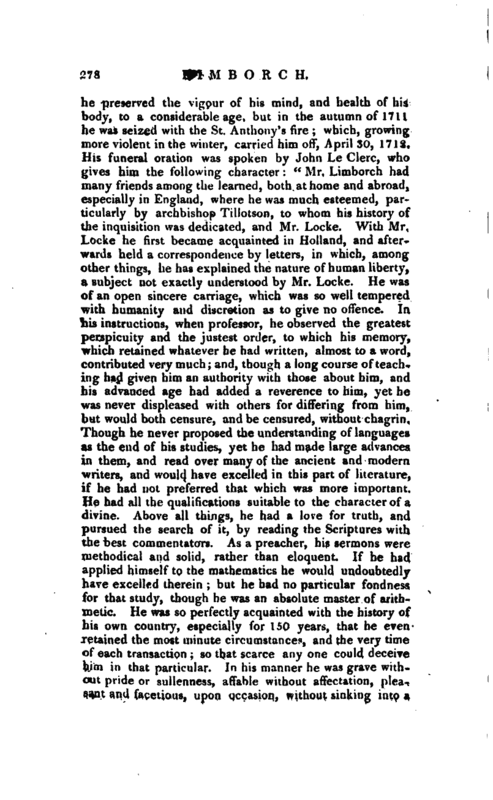 From this time he turned all his studies that way, and acquired a great reputation, not only among those of his own party at home, but among foreigners too, to which his mild and modest temper contributed not a little. Soon after, he published, in Flemish, several sermons of Episcopius, which had never been printed before. * The title of the first edition is, PrscdestinationeTractatusposthumus." In 1694 a young gentlewoman at Amsterdam, of twenty* two years of age, took a fancy to learn Hebrew of a Jew; and was by frequent conversations with her tutor, induced to quit the Christian religion for Judaism. As soon as her mother understood this, she employed several divines, but in vain; because they undertook to prove Christianity from the Old Testament, omitting the authority of the New; to which she, returning the common answers she had learned from the Jews, received no reply that gave her satisfaction. 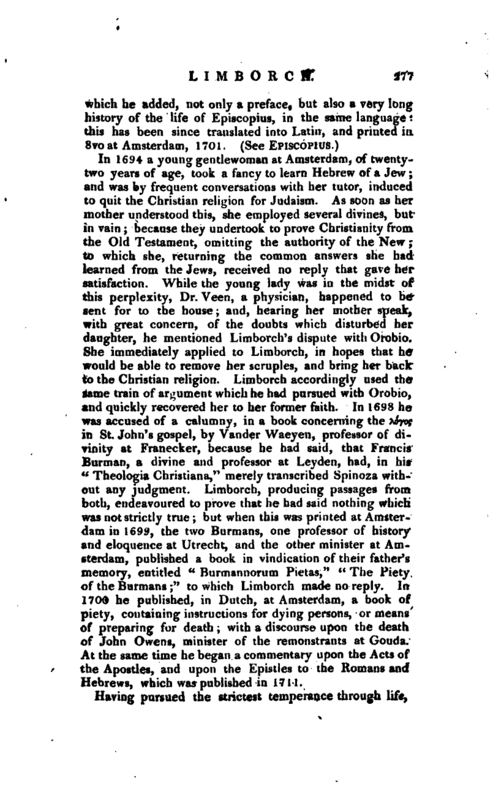 While the young lady was in the midst of this perplexity, Dr. Veen, a physician, happened to be sent for to the house; and, hearing her mother speak, with great concern, of the doubts which disturbed her daughter, he mentioned Limborch’s dispute with Orobio. She immediately applied to Limborch, in hopes that he would be able to remove her scruples, and bring her back to the Christian religion. Limborch accordingly used the same train of argument which he had pursued with Orobio, and quickly recovered her to her former faith. In 1698 he was accused of a calumny, in a book concerning the Xo’yog in St. John’s gospel, by Vander Waeyen, professor of divinity at Franecker, because he had said, that Francis Burman, a divine and professor at Leyden, had, in his “Theologia Christiana,” merely transcribed Spinoza without any judgment. 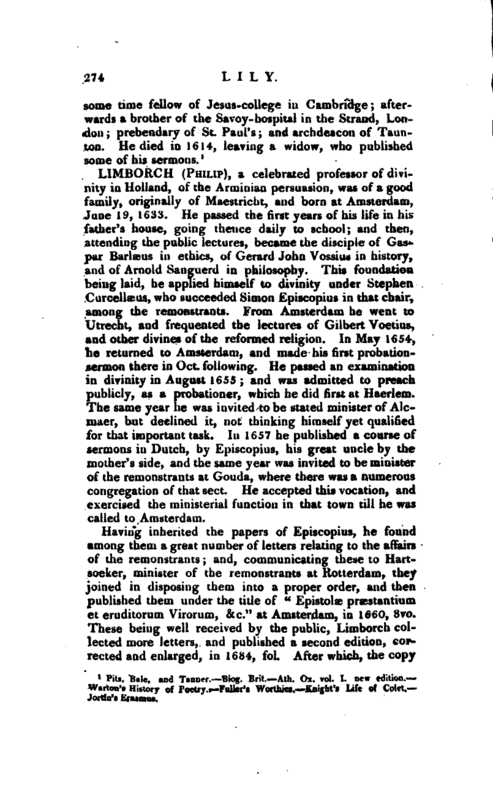 Limborch, producing passages from both, endeavoured to prove that he had said nothing which was not strictly true; but when this was printed at Amsterdam in 1699, the two Burmans, one professor of history and eloquence at Utrecht, and the other minister at Amsterdam, published a book in viiulication of their father’s memory, entitled “Burmannorum Pietas,” “The Piety of the Burmans;” to which Limborch made no reply. la 1700 he published, in Dutch, at Amsterdam, a book of piety, containing instructions for dying persons, or means of preparing for death; with a discourse upon the death of John Owens, minister of the remonstrants at Gouda. At the same time he began a -commentary upon the Acts of the Apostles, and upon the Epistles to th.e Romans and Hebrews, which was published in 1711. Life, by Le Clerc in Bibl. Choisie, vol. XXIV. Gen. Dict. —Moreri. —Niceron, vol. Xl.-—Saxii Onomast. 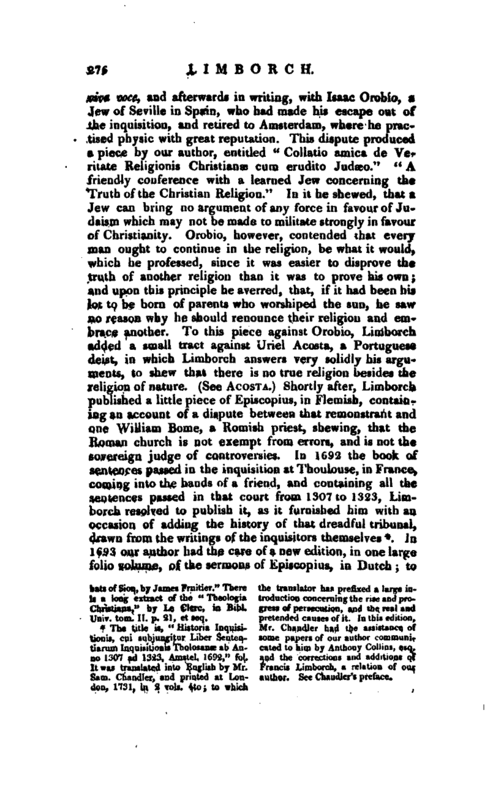 Chandler’s Preface to the History of the Inquisition.